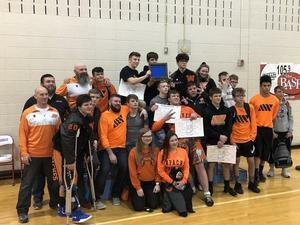 Wabash High School Wrestlers captured the Three Rivers Conference Championship Friday night at Maconaquah High School. Wabash High School Wrestlers captured the Three Rivers Conference Championship Friday night at Maconaquah High School, edging out a tough inner county opponent Manchester 204.5 to 195. Securing the team championship behind individual conference champs Jared Brooks, Ethan Higgins, Braden Brooks, and Justin Samons. The Apaches look to continue to add accolades to this year's historic season next weekend at Peru High School as they go after a sectional championship. Complete conference results are below.